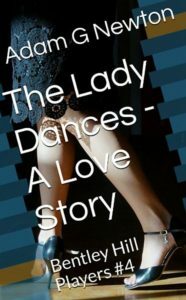 British amateur theatre group The Bentley Hill Players are back with another new show, The Lady Dances (A Love Story) – and this time they are working with the Blackworth Amateur Theatre Stars and Tom McLean. It’s all going well until a protest is staged, and Jim Butler has to convince the council not to stop the show. Matters are complicated by a missing person and the reappearance of the Cohen family, who are out for revenge after Anthony Zimbabwe Cohen was locked up for his crimes in The Death of an Actor. Harry Blunt becomes besotted with a new arrival, and Christopher Crumple gets trapped in a love triangle due to his unfortunate habit of rescuing Zoe McLean from certain death. The Players interrupt a BBC TV show, and manage to get everything ready for the show just in time. Nothing could possibly go wrong! Until it all goes wrong, and the life of everyone involved with the show is threatened…how are they going to dance their way out of this one?